Real-world experience and earnings (cooperative education): Last year UC students earned a collective $66 million by alternating semesters spent in school with paid professional work experiences related directly to their majors. Financial aid: Multiple scholarships and other forms of support; the University provides close to $60 million annually to undergraduates in merit-, talent-, and need-based aid and scholarships. Altogether, the University administers close to $500 million in aid to all students in the form of federal, state, institutional, and private support. Undergraduate profile: Incoming first-year baccalaureate students have, on average, an ACT score of 25.7, an SAT score of 1230, and a high school GPA of 3.616. Retention: UC’s overall first-year, full-time baccalaureate retention rate stands at 86.1%. International student services: Enrollment of international students has increased 78% since 2009 due to a focus on service, support, and retention. Retention is more than 90% for first-year, full-time international baccalaureate students. The 2015 independent International Student Barometer survey of students at 172 universities ranked UC in the top five “most welcoming” in the US. Application deadline: December 1 is the Early Action deadline for admission to selective programs for the subsequent fall. All applications received before that deadline are guaranteed to be reviewed. After December 1, programs with space continue to review applications on a rolling basis through March 1. Be the difference. Discover what fulfills that dream to help others. 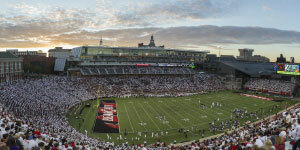 The University of Cincinnati’s College of Education, Criminal Justice, and Human Services is the best place to start. UC’s graduates are teachers, technologists, counselors, sign language instructors, database managers, juvenile advocates, health educators, and substance abuse counselors. The College is dedicated to making a difference in the community through outreach, academic programs, and partnerships. Students and faculty work side-by-side with teachers, athletic trainers, community wellness experts, intervention specialists, and law enforcement officials to gain valuable experiential learning. Current research is incorporated into every course to ensure UC graduates are prepared to address the challenges of society. • The School of Education offers degrees in Early Childhood, Middle School, Secondary, and Special Education, as well as master’s and doctoral programs in such areas as Curriculum, Literacy, and Educational Leadership. • A doctoral program ranked third in the nation is just one offering of the School of Criminal Justice, as well as bachelor’s degrees and a master’s degree available both online and on campus. • The School of Human Services focuses on Exercise and Public Health Education and Sports Administration and offers a bachelor’s degree in Substance Abuse Counseling both on site and online. • Web Development. Cybersecurity. Networking. The School of Information Technology includes instruction on those as well as accelerated programs that offer the unique opportunity to earn an IT bachelor’s degree and one of four master’s degrees at the same time. The College encourages innovation. CECH’s Arlitt Child and Family Research and Education Center is one of the oldest demonstration pre-schools in the US, founded in 1925 as the University of Cincinnati Nursery School. UC embraces diversity. The College’s Center for Hope and Justice Education supports inquiry-based professional development by uniting teachers and students with the community to bring about more humane and inclusive educational practices. We prepare students to have a positive impact and to be contributing members of society. CECH is home to nationally recognized faculty who have knowledge and expertise in various academic disciplines. Students get the highest level of support—academically and professionally. 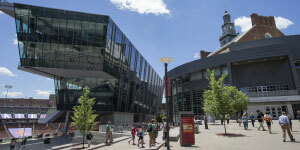 The University of Cincinnati, Ohio’s premier urban research university, is dedicated to undergraduate, graduate, and professional education; experience-based learning; and research. UC is “among the top tier of the Best National Universities,” according to U.S. News & World Report. UC has more than 44,000 undergraduate and graduate students, and the main campus is listed among the world’s most beautiful, according to Forbes magazine. • The online graduate Criminal Justice program was ranked seventh in the country by U.S. News & World Report in 2018. • The University of Cincinnati Corrections Institute has trained over 20,000 corrections professionals at 335 agencies around the globe. • UC’s School Psychology program is the first program in the country accredited by the Association of Behavior Analysis International. • The School of Education was included in the top 100 schools across the country overall by U.S. News & World Report. • The Bachelor of Information Technology program was one of the first IT programs to be ABET accredited in the nation. • An accelerated program that allows one to earn an IT bachelor’s degree and a master’s degree in Business Administration is among the first of its kind in the nation. • The CECH online master’s degree in Information Technology was recognized as the 32nd-best program by CollegeChoice.net. • The School of Information Technology is a national leader in cybersecurity education.